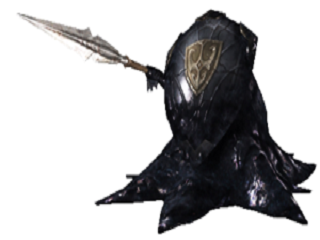 Hoplite is an Enemy in Demon's Souls. Hoplites are slime-like creatures who wield a spear and shield. Found in the Boletarian Palace. Melee thrusting attack. Breaks guards of low hit res shields. Will hit the player even if standing at the side or back of the spear. Spear throw. Very good tracking, thus requires rolling, sprinting or shield block to avoid. These enemies are the ones from Boletarian Palace Phalanx demon boss. They have a shield on their front-side, and a long spear which they either thrust or throw, depending on range. IF it's possible to hit their backside via rolling or circling, they are a quick kill. If they're in a tight corridor however, hacking away, hacking away + turpentine, or firebombs all work quite well. From the front they will obviously take less damage; their attacks are capable of being blocked, so always raise that shield when near! If you start your player off as the Royalty class, then you'll have a much easier time killing these guys. Just spam Soul Arrow at them until they're dead.